It’s Wednesday, and for the last few weeks at least, for me that has meant the Wednesday Wiki-prompt. Week 3’s prompt was this article on the Mercury Dime. I ended up getting pretty abstract with it (a more thorough explanation of why exactly will follow). But for now just give it a read and let me know what you think! In midwinter, an old man shuffles down a snow-deep street. His stomach hurts from the cancer, and blackbirds watch from the trees. He knows they are waiting for night to fall. In his pocket he keeps a coin, and the coin keeps the past — for it bears an image of his wife as a young woman. “Beauty is truth, truth beauty,” the old man mutters. Some forty years back his wife sat for a sculptor, and the sculptor made the coin. People called it the Mercury Dime, but the old man knew: the sculptor had turned Elsie into Liberty, a beauty to behold, a fantasy of freedom. “He loved her, I think,” the old man tells the blackbirds. And maybe she had loved him, he thinks, but this he keeps to himself. The day grows late. The snow begins to gray and the shadows pull long across the street. The blackbirds fly from tree to tree. At home there is a fire waiting, with tall flames turning in the hearth. Elsie will be there, tending the fire, making the dinner, watching the windows for her husband’s return, but the blackbirds don’t see her yet. The sky is nearly dominated by black when he finally arrives, beams of the huge night converging upon the home. 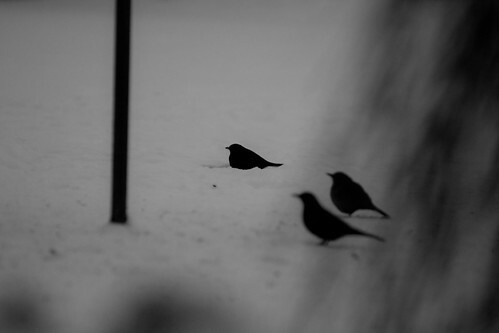 As he reaches the door, the blackbirds cry out and leap from the trees, landing heavy in the heavy snow. He pauses and watches as they hop and turn their heads, and reaches into his pocket to steady his hands. The coin is his comfort and Elsie is his life – but the blackbirds are his future. So now for a little explanation to cut through the abstraction. The subject of this story is Wallace Stevens, a Pulitzer Prize-winning American poet known for his modernist style. The title, “The Fourteenth Way,” is a reference to his poem “Thirteen Ways of Looking at a Blackbird” — and the premise of the story is actually true; Stevens’ wife, Elsie, sat for sculptor Adolph Weinman, who later used her profile as inspiration in his designs of the Mercury Dime. Apart from that, however (and the suggestion of stomach cancer in the first paragraph) this is a work of fiction, but hopefully an enjoyable one. Anyway, for next week’s prompt I’ll be taking this article on Hadji Ali, a performance artist who specialized in acts of controlled regurgitation. That’s right. As you can probably imagine, I’m pretty excited to write a story about him — if you’d like to try, too, just link up your story in the comments below! Meanwhile, to catch up on the Wednesday Wiki-prompt, check out Week 1 and Week 2.